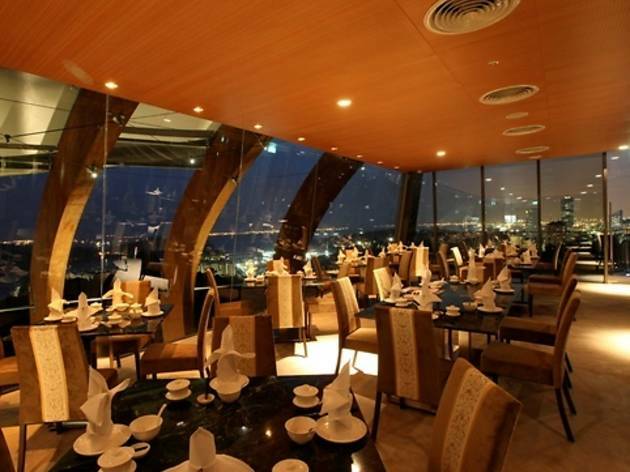 Set in a long, slim glass room atop Mount Faber, the lack of round dining tables challenges this eatery’s status as a Chinese restaurant. 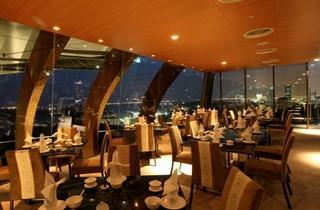 But Empress Jade is exactly that, and superbly Cantonese it is too. Chef Li Chak’s dishes are extravagantly nourishing – try the fresh scallops on ‘three treasures’ appetiser, and the double-boiled seafood soup served in a mini pumpkin that’s been cooked to translucence. Of the three treasures, we liked the scallop with the foie gras – the light but substantial shellfish meat made a fine complement for the rich, fatty liver. The soup, dense with the nutrients of a whole abalone and chunky pieces of fish maw, was surprisingly light on the palate. The double-boiled hashima with papaya in mini fresh coconut dessert is a warm ending to the meal – the use of coconut milk instead of just sugar water adds depth to an already comforting dish. The view from this emerald-themed vantage point is also stunning, allowing you to watch the sparkly cable cars making their way to Sentosa and back. Dine at the right time and you’ll also be able to witness the fireworks set off every night at Resorts World’s Universal Studios.